Form Description: Whenever someone needs to get some paint and body work done to their vehicle, they typically ask for some kind of an estimate up front. The reason for this is rather simple, they want to know (generally speaking) how much they can expect the project to cost. With this Paint and Body Estimate Form you can provide a detailed, and comprehensive, estimate that should satisfy even the pickiest of customers. With this edition of the Paint and Body Estimate Form you have extra wide rows. These wide rows allow you the easier ability to enter the information in by hand. This can definitely be a huge help when you are writing down the work necessary as you go. All in all, it can make a great working copy to use until you are ready for the final version to be given to your potential customer. If there is a single drawback to keeping large amounts of data on a single form, it has got to be how easy it is to get distracted and confused about what is on the form. One way to combat that problem is by using a form that has numbered lines. This particular edition of the form has those numbered lines to help you later on reference the data that you have entered onto it. Show the pride that you have in your company by using personalized paperwork when you can. A perfect example of this can be found in this version of the Paint and Body Estimate Form. It has been created so that you can personalize it to your specific company, including all your contact information. 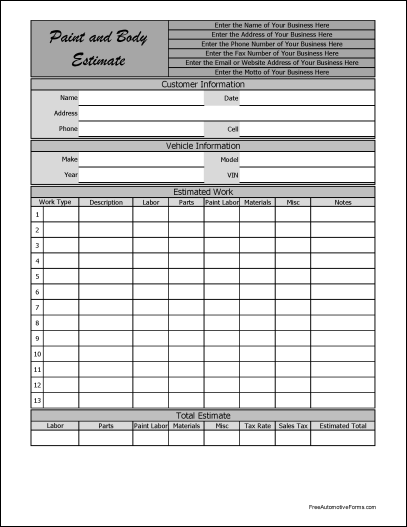 You can download a PDF version of the "estimate, paint, body, automotive, service, fancy" form absolutely free. You can also, for a small payment, download a fully editable version of the form that you can customize as you desire. (Don't know which format to choose? Here's how to make your choice.) What would you like to do? FreeAutomotiveForms' free "estimate, paint, body, automotive, service, fancy" form is associated with the following keywords: estimate, paint, body, automotive, service, personalized, wide row, numbered row.